The ubiquitous saxophonist goes way forward and way back on this trio date. Chris Speed has been an essential New York City jazz saxophonist for nearly 25 years since he arrived from the New England Conservatory (and, originally, Seattle). That is a long time to be not only making great music on your own but also as one of the essential on-call improvisers in jazz’s greatest city. Speed’s run of classic recordings from 1997 to 2000 (Yeah No, Deviantics, Iffy, and, my favorite, Emit as well as all the recordings by the band Pachora) was a bracing wind of originality that combined Eastern European folk elements (Klezmer, Balkan music) with everything else. In the meantime, he was and has been working with Dave Douglas, Jim Black, John Hollenbeck (in the Claudia Quintet), Myra Melford, Tim Berne... can I stop now? The man is tireless, including starting a record label to get creative music out there for others. Tirelessly creative. In recent years, Speed’s playing has been transformed, at least to my ears. His tone has become less brassy and softer, and his playing -- always melodic -- has developed a gravity that has something to do with never playing an easy lick. He will tell you that he has turned his listening back to certain saxophone masters: Lester Young, notably, and Sonny Rollins, Don Byas. He has been leading a trio recently with Chris Tordini on bass and Dave King on drums. And the music is deep, swinging, and insistently compelling. It’s worth noting up front that Tordini and King are no mere sidemen here. Tordini is playing with everyone right now, from Tyshawn Sorey to Becca Stevens; King is, of course, best known as the drummer for The Bad Plus. These guys have gigs-a-plenty. But their playing with Speed is glorious. The imperative for this band is finding classic sounds and grooves but wedding that jazz pliancy to the New Jazz of this century. Speed’s compositions do not skimp on the tricky elements that are the bread and butter of the New Jazz — complex/overlapping time signatures particularly. But the band is always swinging in 9/8 or 12/8, in 3/4 or even just 4. The guys play some high-level stuff, but almost every tune on Platinum on Tap is a toe-tapper on one level or another. King -- thought of as the loudest drummer in jazz because of The Bad Plus -- simply skips and swings here light and leaning forward, his ride cymbal a thing of joy and his snapping accents on snare and toms sounding positively Max Roach-ian. Tordini is sometimes a walking fool, playing quarter and eighth notes in a rubbery flow. At other times, he works a pattern in conversation with King. But, one way or another, the tunes pop and burble and gallop. The ballads stroll and sway. “Pretty Much”, in contrast, is a happy and playful jazz waltz. The band lets it sway and lets it swing, leaving the complexity to the conversation: Speed tracing circles of melody as he improvises while King maintains a near-continuous dialog with the horn. Tordini gets in his licks here too. Only two songs were not written by Speed, and they are telling. “Stardust” is programmed late in the disc, and as it begins you recognize the famous introductory phrase. But after that, we are accustomed to hearing the 32-bar melody. Speed chooses, instead, to begin improvising immediately, winding his way around the melody more than “running the chord changes”. His tone and pace are both conversational, almost mumbled, spoken with a nonchalance. Speed leaves generous rests in his line, which contains hints of the melody at every turn. The full melody waits its turn until after the bass solo, and it comes as a revelation, almost sounding improvised itself. The very last tune is Albert Ayler’s “Spirits”, which Speed approaches with playfulness. The melody is a lark and also an excuse to just let the band loose on a brief, fast slice of free-bop. That Ayler cry and portent? Nah, in Speed’s hands everything is a light beam. I am particularly partial to a couple of the outliers on this record, maybe because the exceptions prove the rule. “Crooked Teeth” is wildest, freest exercise here, which is to say that Speed play with the most abandon and growl -- yet he never loses that sense of Lester Young lightness. Also, the time is very nearly straight walking swing, but there is so much conviction that it sounds tricky still. I also very much like “Arrival High”, where King and Tordini are exceptionally busy, creating an Afro-Cuban bed of vibration while Speed plays a very quiet, half-timed melody on top. The tenor solo picks up momentum, beginning as if the horn was intimidated by the groove and ending in an ecstasy of runs and melody. 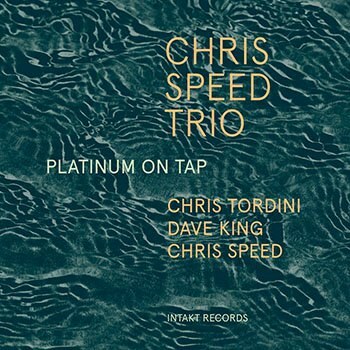 On this tune -- and, really, all over Platinum on Tap -- Chris Speed is working with a combination of 21st century freedom and mid-20th century gravity. While his tone is increasingly flutey for a tenor player, he places each note on the line as if he were building a wall. Speed rarely plays flurries or spasms of notes. Rather, he strings them together with attention to shape, strength, and direction. In that way he is old-fashioned with a purpose. As much as the trio setting -- which is to say, the absence of a chording instrument -- lets us really hear all of Speed’s deliberation and tone, I will also confess that I miss the support that a piano or guitar would bring to the band’s sound. Speed has plenty to push off and play against, but the presence of one other soloist to generate conversation would be a plus in my mind. Trio records can be oddly solitary. For Chris Speed at this moment, however, a quiet confidence and room to stretch out are just time.